The very severe cyclone Vardah now lies just about 150 kms to the east of Chennai coast as of early morning today at about 4:30 in the morning. As things stand the system is still packing a strong punch as a Very Severe Cyclonic Storm and going by the latest Dvorak estimates is now showing some signs of weakening. With the system very close to the coast it is unlikely the weakening would be fast enough for the effects to be mitigated before Cyclone Vardah scores a bulls eye with Chennai landfall. From now we could see a slow but gradual weakening expected of Vardah but a rapid decline is not on the cards. Cyclone Vardah is expected to make landfall as a strong Category 1 Cyclone with wind speeds in excess of 100 km/h. The landfall point is likely to be very close to Chennai with possibly better chance for the stretch between Chennai & Pulicat likely to see the landfall. Rains have already started around Chennai with most weather stations in the city recording about 3 cms already since midnight. Similarly most stations have started to record wind gusts of about 20 km/h which is expected to increase as the day breaks. Unless its absolutely necessary please do not step out as Uprooted Trees / Electricity Poles and snapped wire risk would be very high between 12 PM & 5 PM. At the time of Landfall the wind direction would reverse as the Center of the Cyclone moves over land. The wind direction is predominantly expected to be from the land depending on your location in Chennai before the landfall. Strong winds will be blowing from West as Cyclone Vardah moves ashore, though this system has not developed an organized eye we are likely to see a period of calm when the Center of the Cyclone crosses shore. Please note this period of calm could be deceptive making you wonder the worst is over. The worst phase of winds are normally packed after the landfall of center when the directions completely reverses and the next bout stronger winds hit once again. The winds that follow the center normally is stronger than the winds that preceded landfall. 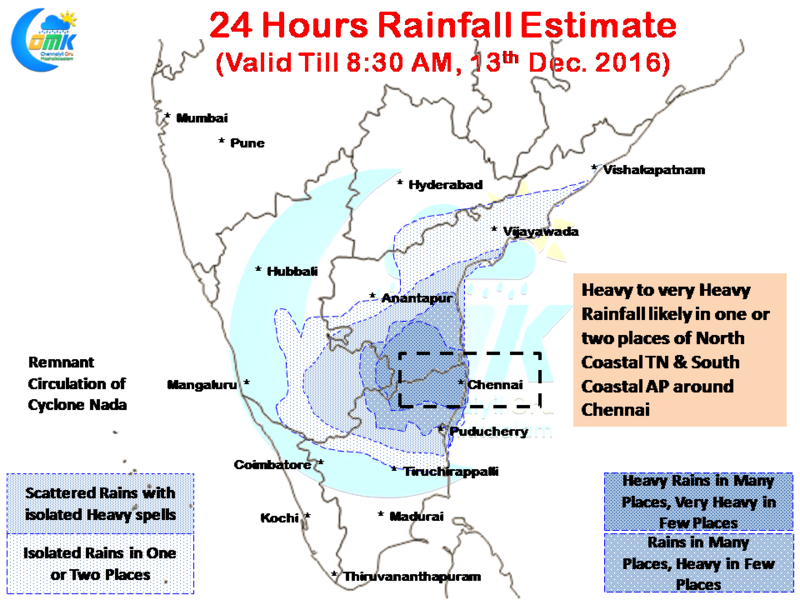 North Coastal Tamil Nadu is likely to see rains continue all the way till later tonight with rains getting heavier as the day progresses. The heaviest rains possibly would happen before landfall thanks to the Western Quadrants being heavily moisture laden. As Cyclone Vardah passes through the interior places in its journey rains would pick up in places to the west of Chennai.